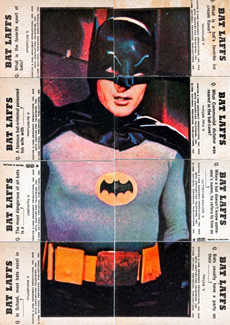 The Black Bat Cards, Red Bat Cards, Blue Bat Cards and Macleans Batman Cards all featured color illustrations of Batman the comic book superhero however there was another set released in 1966 featuring stills from the full color TV series and 1966 Batman movie: the Bat Laffs Cards. The Bat Laffs set features 55 full color photos from the popular Batman TV series (as well as some from the movie of 1966) and star, among others, Adam West (Batman), Burt Ward (Robin), and Cesar Romero (Joker). The cards are numbered on the front and have a black keyline border around the photo with a white border around the card. 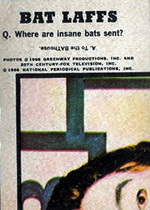 Like the illustrated Red Bat and Blue Bat sets, the Bat Laffs set also featured puzzle pieces on the card backs. Below I have two examples of the completed puzzles. This set was produced by Topps for the USA market. The backs of the cards state "Copyright T.G.C PRTD U.S.A". 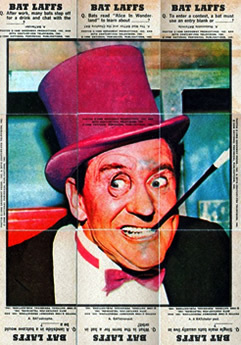 It is worth noting that there were in fact two print runs of the Topps Bat Laffs cards: one with and one without an advert for the 1966 Batman Motion Picture release by 20th Century Fox. This set was produced by O-Pee-Chee for the Canadian market. These cards state "Copyright T.G.C PRTD in Canada". This set was produced by A&BC Bubble Gum for the UK market. On the backs these cards state "Copyright A&BC Printed in England". This set was produced by Scanlens Sweets for the Australian market. On the backs these cards state "Copyright T.G.C PRTD in Australia". It is worth noting here also that, like Topps, Scanlens produced a second run with a slight variation. 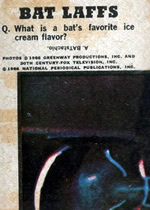 The first run features the advert for the 1966 Motion Picture while the second print run replaces this with "Scanlens Sweets". The 1966 Bat Laffs cards are awesome additions to any great collection - even considering the terrible 'jokes' on the back! These cards bring back many memories to anyone who spent hours watching the original Batman TV series, as well as documenting this time in history. I highly recommend you check out some online auctions if you don't yet own these cards. The Bat Laffs cards are somewhat readily available for sale. As with the Red Bat and Blue Bat cards, the Bat Laffs cards were well played with due to the puzzle back; this can mean mint copies are hard to track down and not cheap when available. Cards with some yellowing and rough edges still make great collectables and I think show the life these cards have had - they are well over 50 years old after all!